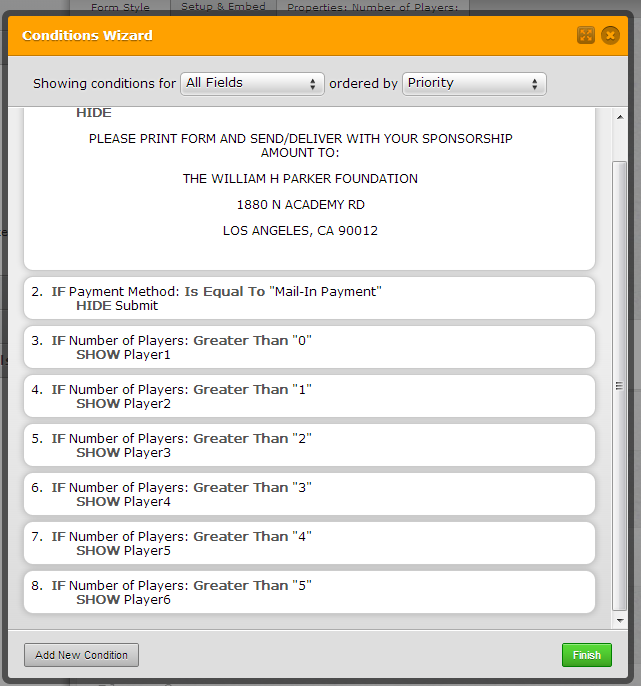 I have created a form where the user chooses a number of players attending and based on that number a multiple of the same question comes up so that we can obtain information ( name and t-shirt choice). I cannot get the conditions option to work for this drop down number choice, all the name and t-shirt options show up on every choice, every time. May I recommend using the Number field instead in replacement to your dropdown field. With the number field, you can easily use the greater than > rules to assign a better action logic. This guide How-to-Hide-or-Show-Multiple-Fields-at-Once-Based-On-a-Single-Conditional-Entry should help also to simplify the form condition setup. Here is a demo form http://www.jotformpro.com/form/32478767622970 you can test. I setup the condition like this.